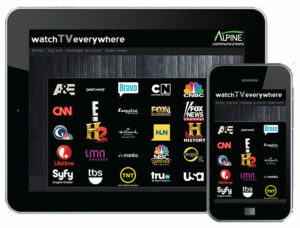 Because you’re an Alpine FusionTV customer, we’re bringing you a convenient new way to enjoy TV. On the go, on any device! TV Everywhere streams some of your favorite channels and programming — including live TV and full episodes of current TV shows — to your tablet, smartphone, laptop or PC. And it works from anywhere you have an Internet signal: at the office, hotel, airport or vacation home, and everywhere else! 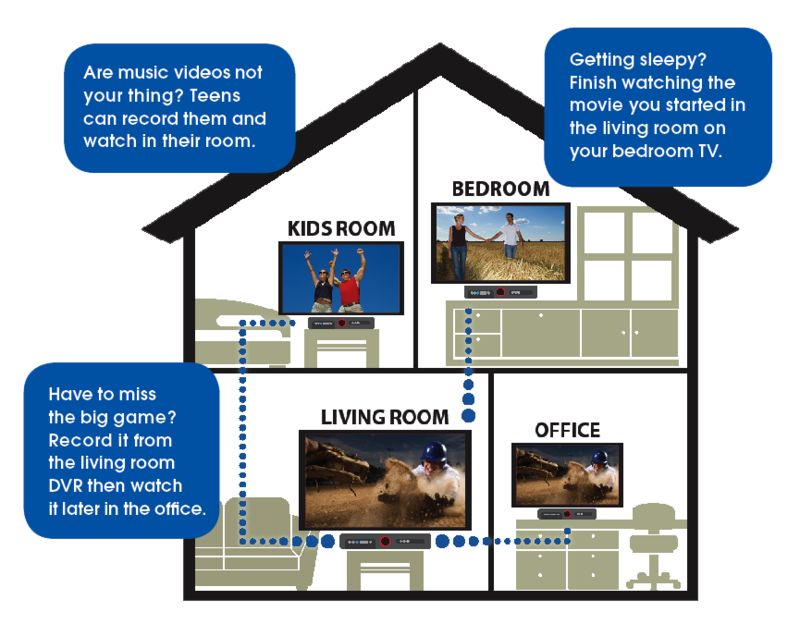 Plus, TV Everywhere is included with your FusionTV service! You only need a subscription to the network you want to watch. For example, you must be an ESPNU subscriber (Premier Package) to watch ESPNU’s TV Everywhere programs. View Flyer Here. Before gaining access, you must register, so have your Alpine Communications account number handy. It’s quick, easy and included with all FusionTV subscriptions. More TV Everywhere channels are on the way! We are actively working with other providers to secure additional channels to offer you the most available entertainment options. 1. Get a Password – You will need your Alpine Communications account number (it’s on your bill) and a valid email address to register HERE for a free TV Everywhere password from Alpine. Once you register, you will receive a confirmation email and you will need to click on the link in that email to complete your registration. USING A WEB BROWSER – Go to wtve.net and enter your email address and password. Then click on the logo of the service you want to watch, and select programming from the on-screen menu. USING A MOBILE DEVICE – After you log-in with your password at wtve.net, click the network you want to watch. At each network’s page you’ll find links to free Android and iOS apps you can download to watch on mobile devices. The first time you use a new app on your device, you will be prompted to select Alpine Communications from a list of providers and enter your TV Everywhere password. If you can’t be at the game in person, High-Definition programming with Alpine FusionTV is the next best thing. FusionTV gives you over 90 HD programming choices* at any given time. Experience a high resolution picture that’s so vivid and crisply detailed, you’ll feel like you’re right in the middle of the action. From movies to sports, local networks to premium channels, FusionTV has you covered. Get started today and save when you bundle FusionTV with home phone, Internet, and more. Click here to bundle and save with a Peak Savings Pak. *A monthly HD equipment fee may apply. Enjoy the freedom to record and watch programs in multiple rooms with FusionTV’s Whole-Home Cloud DVR. With Whole-Home CDVR (Cloud Digital Video Recorder) service, it’s quick and easy to automatically record an episode or a whole season and watch it at your convenience. You can view DVR recordings using any networked set-top box in your home, and even finish watching a recorded program in one room that was started in another. DVR until your heart’s content! $12.95 – 250 GB storage + 4 streams of recording – BEST VALUE! FusionTV Whole-Home CDVR allows you to watch TV on your terms with a touch of a button. It doesn’t matter what time your program actually airs. Record it and watch when it’s convenient for you. With your CDVR, you control the TV schedule. Add Whole-Home CDVR to your account today by calling 563-245-4000. *This feature is available with CDVR. If you have a traditional FusionTV DVR service installed before July 1, 2018, you will need to switch to CDVR to obtain this feature. Use Alpine’s FusionTV mobile app to manage your FusionTV service from most Android and iOS/Apple Devices. 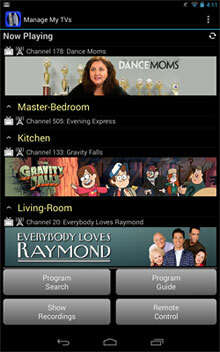 View and Search TV program guide. Filter channels on TV program guide by subscribed or favorites. View list of recordings from all DVR enabled set-top boxes. Manage all DVR recordings including scheduling a one-time or series, deleting existing, viewing currently recording, and organizing in folders. Perform remote control functions including changing channels. Let your television be your stereo with 53 digital music channels from Alpine. Everything from rock to country, jazz to classical, and much more! View the FusionTV digital music channel lineup here. Your community is tuned-in to Alpine FusionTV’s local community information channel for the inside story on what matters in our area. Press theYellow Button on your Remote Control and click on WEATHER! Individuals, organizations, businesses, civic groups, and government agencies can all benefit by advertising on ACTV Channel 3. Utilize 15-second still graphic ads that rotate among other ads and community announcements. Your ad has the potential to play over 100 times per day. Ads will run from Monday to Monday. Alpine reserves the right to design slide for what looks best. Contact Alpine for more information about promoting your business or event on FusionTV’s ACTV Channel 3. Click here to Contact Us. Non-profit organizations and government agencies may be eligible to receive a FREE ad displayed for up to 2 weeks. Please contact us to see if your event qualifies. "We are very pleased with service we get!"